By Dean Schwartz (SWAG Master): Mobile phones have changed our lives. In fact, it is getting harder and harder to remember how anyone functioned before cell phones. 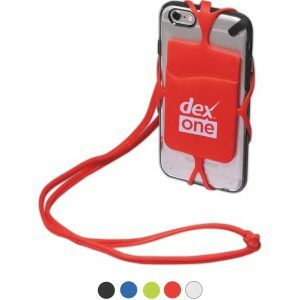 And while tech companies are continuing to search for the next device that will change your life, there is already a phone accessory that very well might change your life, the wallet phone case. When leaving the house, most of us need 3 essential items: keys, wallet, phone. A wallet phone case combines 2 of these 3. Not only is it one less thing to forget on your way out the door, but it also lightens your pockets and keeps your must-carry items in one compact place. The result: daily life streamlined. Count us in! At SOBO, we are constantly looking for products that are high-quality, creative, and functional, and wallet phone cases hit the mark. Because this product is so functional, people are highly likely to use it, and that makes it the perfect opportunity for branding. 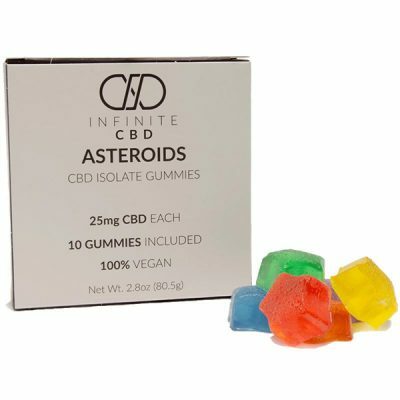 Check out a few of our favorites. When you only want to carry the bare necessities, this clever wallet makes it possible! This artisan wallet safely holds credit cards, IDs and cash in its sleeve and the enclosure strap ensures your cards are secure. Equipped with an adhesive, the case securely attaches to the back of any smartphone and won’t leave any sticky residue. Choose between two colors and screen print your logo for maximum brand exposure. This is a great gift at corporate functions, trade shows, or any other promotional event. 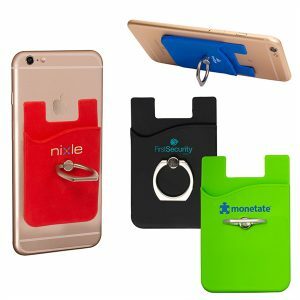 Silicone smartphone pocket features a rotating metal ring on the back that doubles as a holder and a stand. 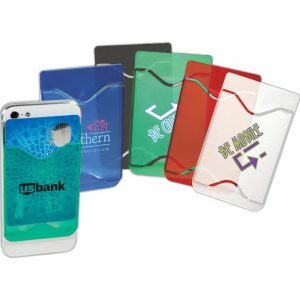 Includes removable adhesive for placement on the back of your mobile device. 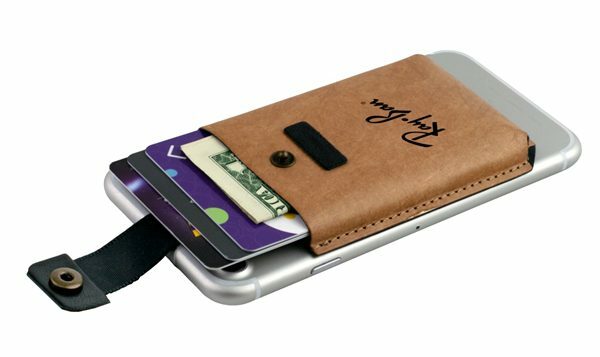 The single pocket is perfect for credit cards, IDs, and business cards. 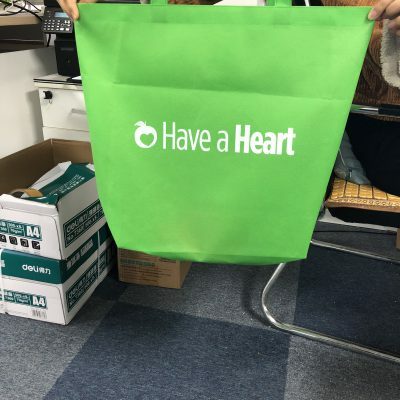 Imprint with your logo for a perfect corporate give away. 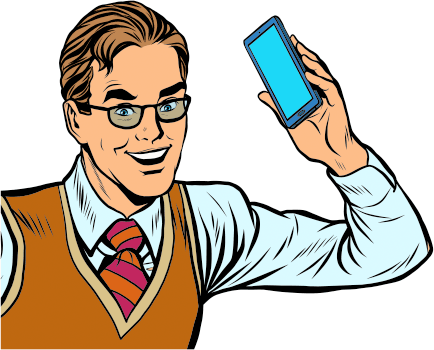 Brand an item your audience handles all day, their phone! The card caddy is a plastic holder that adheres to the back of mobile devices. Slip credit cards, business cards, driver’s licenses, hotel room keys or other small personal items into the caddy for easy protection and accessibility. Brand them with your logo and give your audience the ultimate convenience. Carrying around your phone, cards, cash has never been easier! The patented Strappy mobile device pocket features a detachable lanyard for easy transport. This handy product is made of silicone and available in several colors. 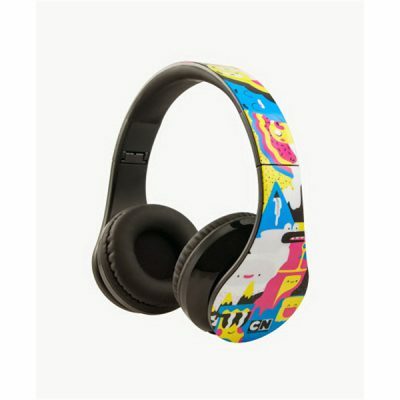 Customize with an imprint of your company name and logo for increased brand visibility on a must-have product. Check out all our wallet phone cases in our catalog. Or better yet, give SOBO a call 888.752.0432 or email info@soboconcepts.com and get your order placed today!